A Mesolithic flint axehead was found in this field in 2000. Metal-detecting between 2001 to 2003 recovered a possible Neolithic retouched flint flake; medieval pottery sherds; medieval coins; post-medieval tokens; undatable slag and medieval to post-medieval metal objects. The metal finds include medieval dress accessories and copper alloy tripod ewer leg; a medieval/post-medieval cast copper alloy cauldron fragment and post-medieval dress accessories, book clasp, spur, casket key, lead cloth seal and lead window came. 1 Mesolithic flaked flint axe. See drawing (S1). K. Hinds (NLA), 8 June 2000. Amended by P. Watkins (HES), 5 June 2014. 1 medieval coin (long cross penny) and 1 pottery sherd (unglazed). Also slag, lead and assorted post medieval and modern period finds. D. Gurney (NLA), 30 July 2001. Amended by P. Watkins (HES), 5 June 2014. 2002-2003. Metal detecting. Site enlarged . 2 medieval coins, 1 pottery sherd, 2 belt mounts, 1 ?strap end, 1 ?buckle, 1 buckle, 1 copper alloy ewer leg and 2 lead pot mends. 1 medieval/post-medieval copper alloy cauldron fragment. 2 post-medieval tokens, 1 belt mount, 1 book clasp, 1 spur, 1 casket key, 1 lead cloth seal and 1 lead window came. Flint identified by P. Robins (NCM), numismatic items by A. Marsden (NLA) and other objects by A. Rogerson (NLA). See list and descriptions in file. A. Rogerson (NLA), 7 November 2003. Amended by P. Watkins (HES), 5 June 2014. <S1> Illustration: Robins, P. 2000. 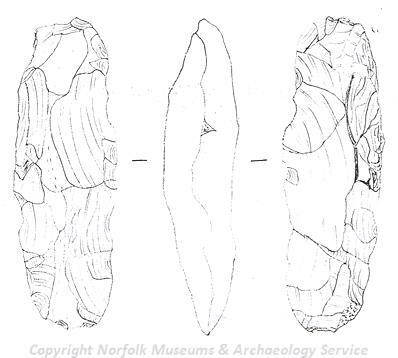 Drawing of a Mesolithic flaked flint axhead from Coltishall. Paper. 1:1. <S2> Article in serial: Gurney, D. (ed.). 2001. Archaeological Finds in Norfolk 2000. Norfolk Archaeology. XLIII Pt IV pp 694-707. p 695.